Showing you a design that (in my eyes) went so wrong. I had the perfect image in my mind how I wanted this to look and wow, this was hard..and did not turn out as I had envisioned. I'm not feeling so well, caught the bug that my son had so I'm going to blame it on that. And the fact that this 31 day challenge doesn't allow much down time. I didn't have the time to re-do where I thought it went wrong...so here you! This is fulfilling my Day 11 requirement for dots in the 31 Day Challenge and my Digit-al Dozen Blue week requirement! Look forward to blue stripes tomorrow!! I started with Trixie, this is two coats...my bottle is a tad bit thin, so it wants to flood the cuticles...but otherwise no issues and it's just a perfect metallic silver. Thumb and pinky have Song from the 2012 NYFW Diva collection. The formula is insanely good. FULL coverage with ONE coat. 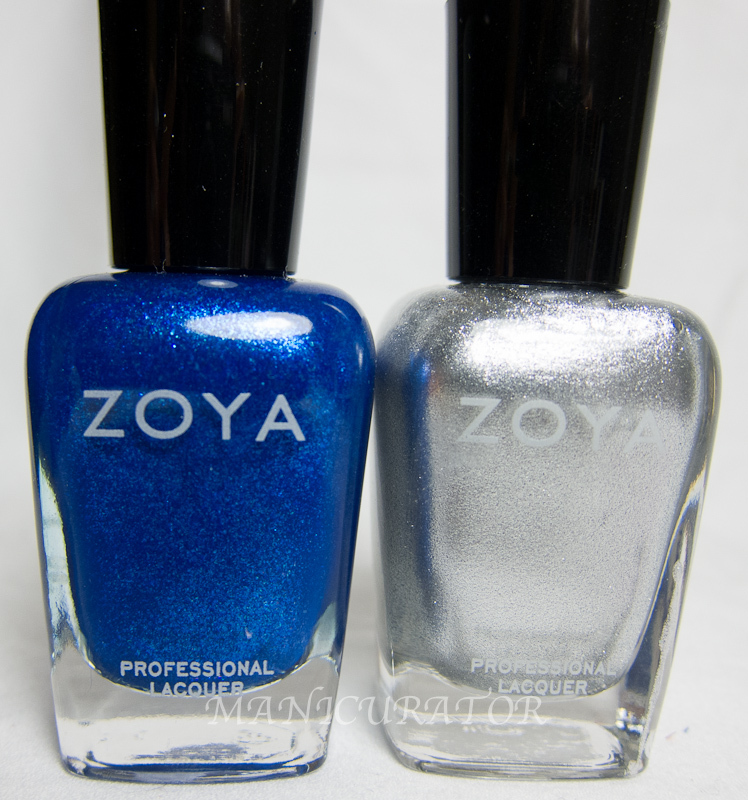 Yup this baby is one coat :) Zoya describes it as such "Bold, vibrant medium primary blue with silver and blue glittery metallic sparkle. A very vibrant blue with a glittery finish that's smoother than traditional chunky glitter." this looks great! you are such a perfectionist! You're crazy lady, this is awesome! I think it's wonderful! I love the blue and silver combination! Hope you and your son are feeling better soon. Wow FAB combo, just amazing! holy wow!!! this is amazing! Such a great combination of shades! Love the color combo and the dots! Awesome! You may consider this a fail but I say it's bloody amazing!